You don’t often need to add ‘bad weather’ to photos in London, however, if you’re on holiday and feeling a little homesick, then you can add just the right amount of atmospheric rain and snow to your beach pics with a simple tap of the thumb/forefinger (whichever is your prefered phalange) with the new photo editing app Photone by Mykola Basyuk. Jokes aside, nothing says a good time like a well-timed ‘candid’ shot of yourself looking introspective in Montmartre. But what if it’s a sunny day? Just your luck right? You go to the city of tortured artists (love?) and there’s nothing but blue skies, sunshine and helpful French people. Not exactly romantic is it? Where’s the heart-ache, the gloom, the despair for the human condition? Worry not, your envious friends on the other side of the pond will still be able to froth over your artistic trip and you can come back with a tan to boot! Photone lets you play around with all different kinds of fun effects like the ability to add rain, snow or even burnt edges to give your photo’s that ‘buried treasure’ feel. The Complex processing involved in the monotone filters means that you can pick between cold, warm and mixed tones giving you subtle and varied results, not just simply desaturating your picture. But Photone understands that life isn’t just black and white, so they’ve added in a imagination catalyst of 15 other fun filters that will add sophistication and an artistic flare to any of your snaps. Another fun feature of the app is the ability to colourise your photo’s with elaborate and trendy gradients, which means that your life can literally be documented in rainbows. After you’ve rocked out your photo and made it ‘just right’ then you’re only a quick tap away from being able to send it out into the ether and start making everyone jealous. Win. 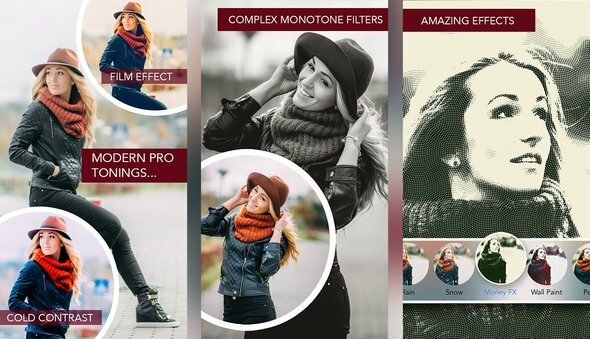 I’m not sure if Photone’s reinventing the wheel here but if you’re in the market for an all-in-one photo editing app, with fun features and filters, you can’t really go wrong with splashing out on the nominal $0.99 and making all of your editing a sinch. To download Photone and become an Insta-Queen/King visit the App Store today!